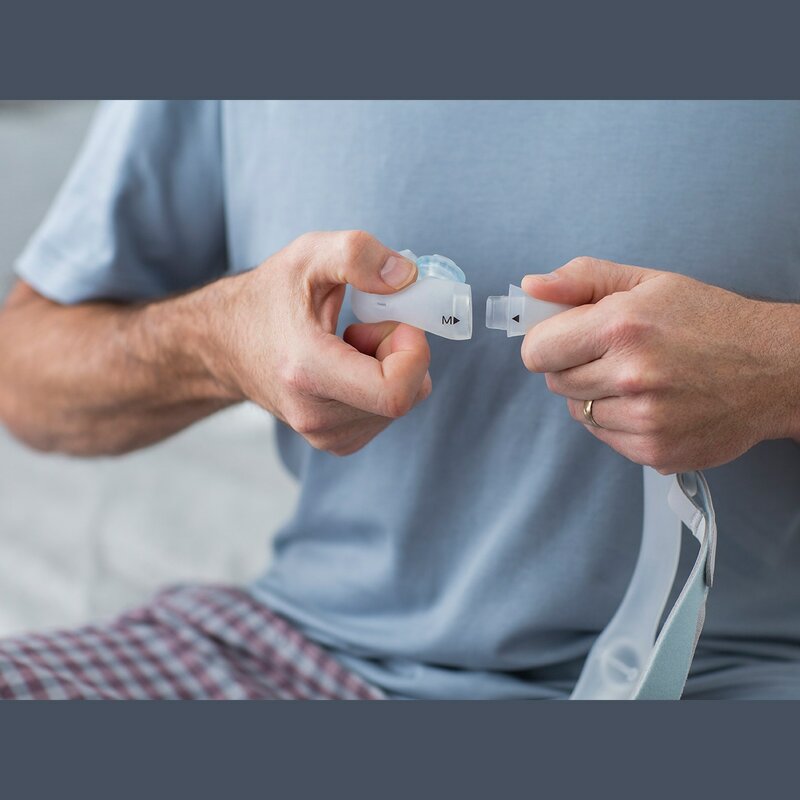 Designed to feel like you're wearing nothing at all the DreamWear Gel CPAP/BiPAP Mask is a truly breakthrough sleep therapy interface. DreamWear Gel's unique soft frame directs airflow through two tubes that meet at a pair of gel infused nasal pillows for a simple, minimalist fit that adapts to your sleep therapy needs and maintains secure seal that feels like it's barely there. Multiple Pillow Sizes Included So You're Guaranteed Your Best Fit! Sleep Your Way with Under-the-Nose Cushions or Gel Nasal Pillows! 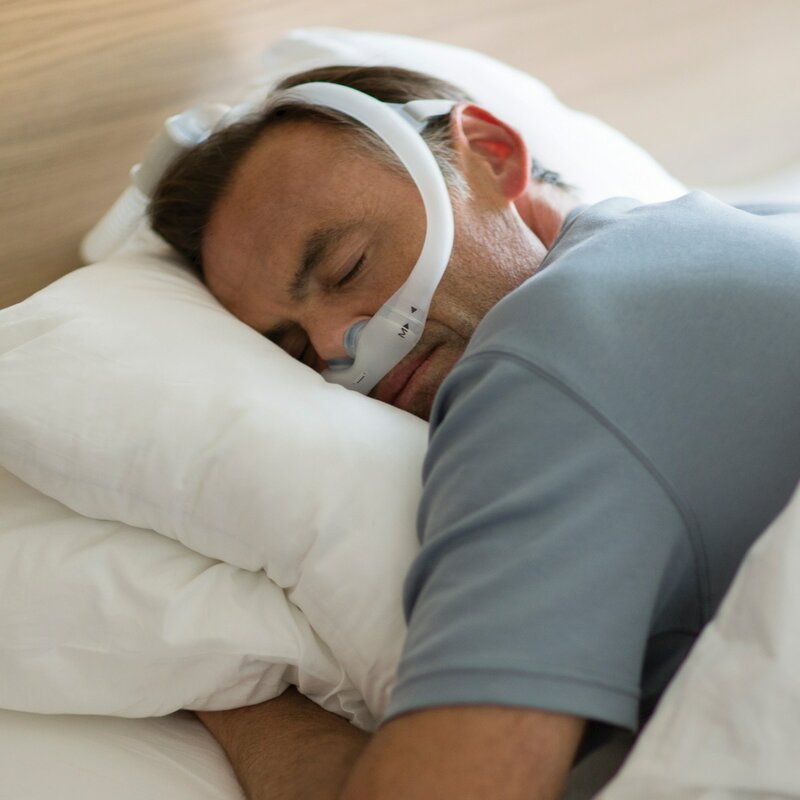 Innovative Soft Tubing Frame: One of DreamWear's most exciting innovations is the soft frame that directs airflow through two silicone tubes to join at the nasal cushion. Because the frame is soft it adapts naturally to facial contours without pinching or pressure points; and it will accommodate almost any sleeping position. If you sleep on your back DreamWear Gel distributes therapy air through both tubes equally. If you shift onto your side DreamWear Gel's lower tube compresses to maintain a comfortable seal without pressing into the skin; therapy air is channelled into the open, upper tube maintaining an unrestricted airflow at prescribed therapy levels. Optional soft fabric wraps can be wrapped around the tubing for extra plushness! 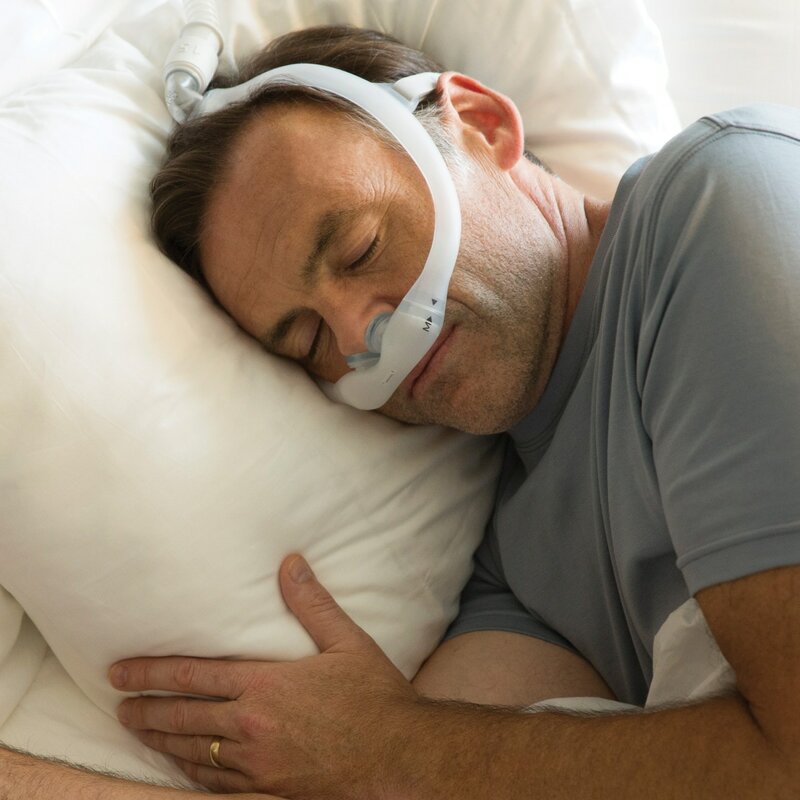 Revolutionary Gel Nasal Pillows: Philips Respironics, the world leader in gel cushion technology, brings the adaptive power and comfort of gel to DreamWear Nasal Pillows. 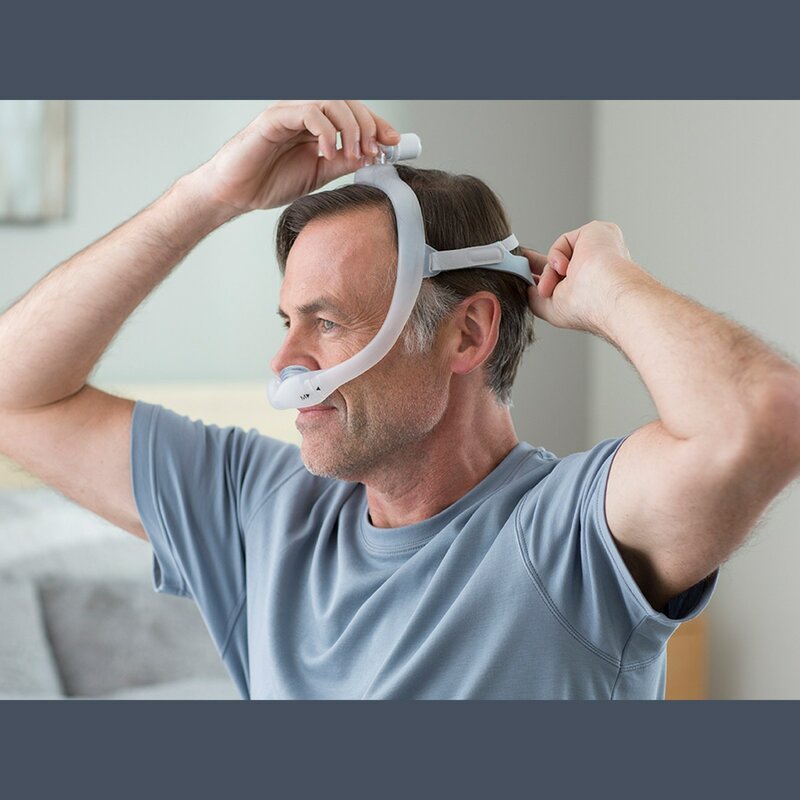 DreamWear Gel Nasal Pillows are infused with a ring of soft, flexible gel that rests on the outside of the nostrils to create a secure seal without pressure or pinching. 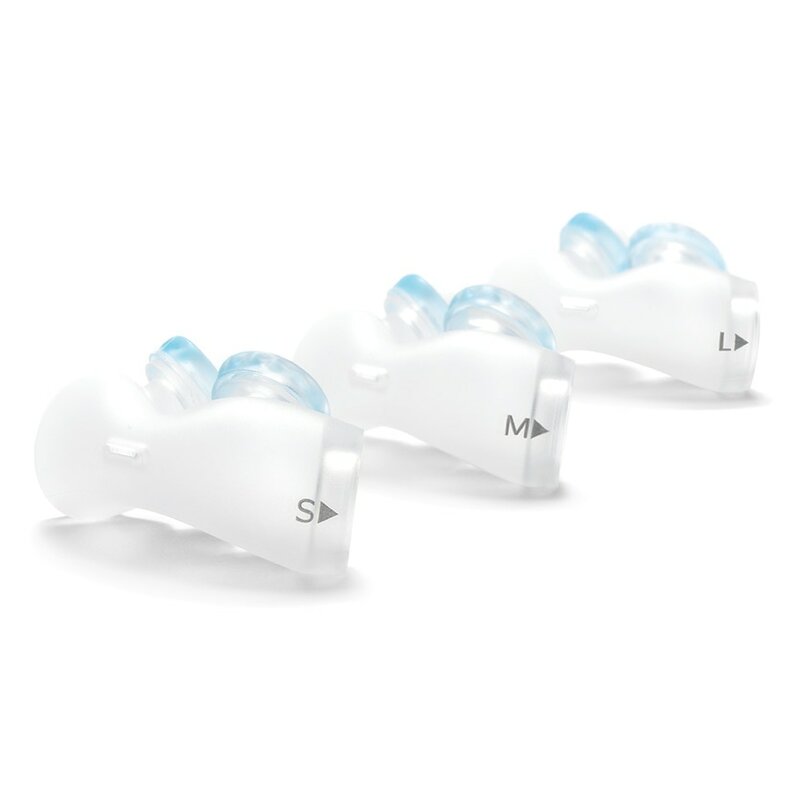 Each mask comes with three nasal pillows cushions -- Small, Medium & Large -- so you'll be sure to find your best fit right out of the box. Simple, Secure Headgear & Tubing Attachment: DreamWear Gel features soft, single strap headgear that rests at the back of the head, stabilizing the mask without requiring over-tightening or excessive contact. The tubing elbow is located on the top of the head where it can swivel freely to help reduce drag and clutter on the bedsheets. 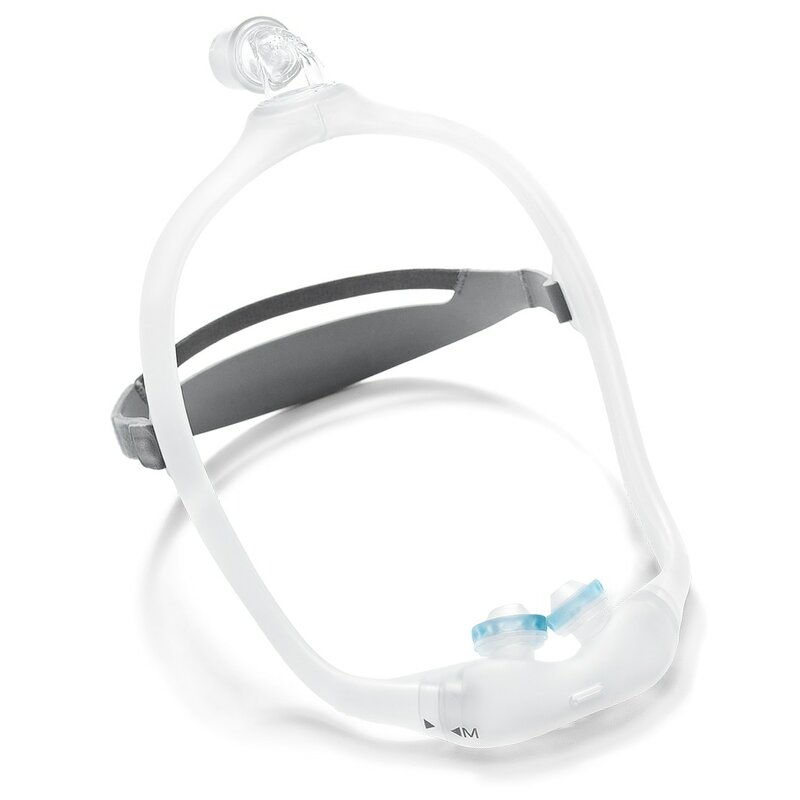 Lightweight with Minimal Contact & an Open Field of View: With its combination of a low profile cushion, a soft tubing frame, and single strap headgear the Dreamwear is one of the most minimal masks available for CPAP/BiPAP therapy. It provides the user with an open field of view for reading, talking or watching TV before bed. 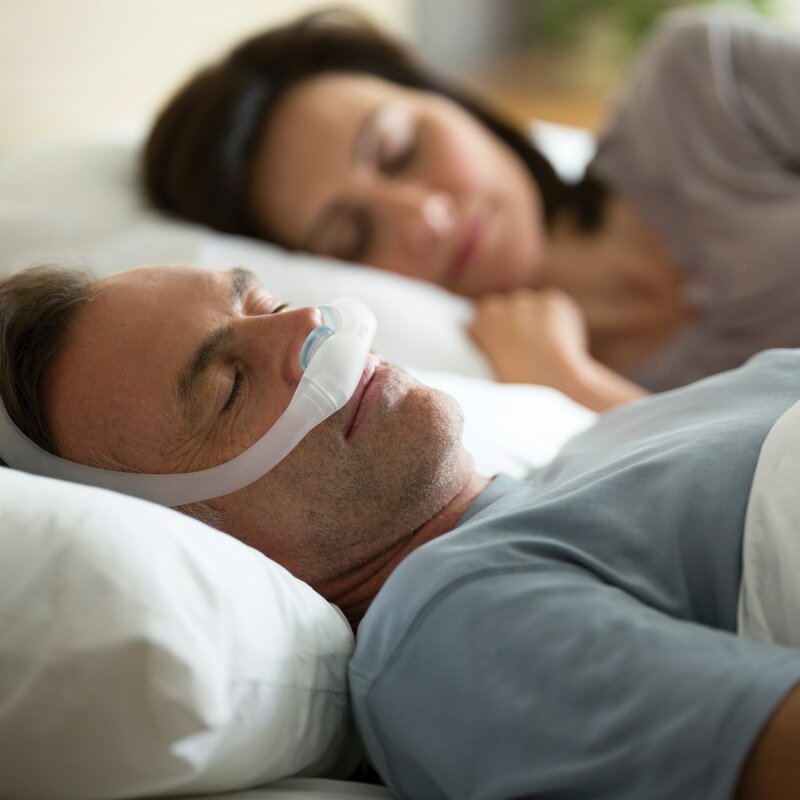 Sleep Your Way with Under-the-Nose Cushions or Gel Nasal Pillows! The DreamWear Gel Mask is completely interchangeable with the original DreamWear Nasal Mask. All parts, including cushions and nasal pillows, are interchangeable so if you prefer to sleep with gel nasal pillows one night and an under-the-nose nasal cushion the next you're free to do so. Just purchase the DreamWear cushions or pillows you prefer and switch them out to suit your mood! 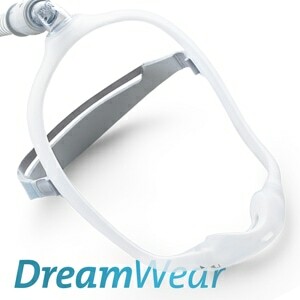 In The Package:DreamWear Gel Nasal Pillows CPAP & BiPAP Mask with 1-3 Pillows, Frame, and Adjustable Headgear. Ok, but still miss my Breeze. I used the Breeze mask for years and always slept comfortably. The DreamWear is ok, but it has a tendency to slip off my nose. I prefer sleeping on my side and have problems getting comfortable without the nasal pillows slipping. It is the best I tried though. I just wish I could still get the Breeze. 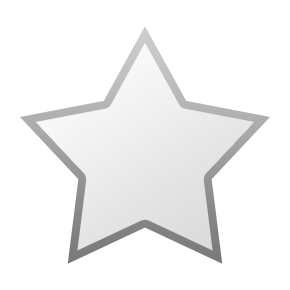 The website Cpapxchange has always been great to do business with!! I am new to the CPAP/BiPAP machines, so I am not sure what to expect. I tried using this many times and it just does not seem to work for me. I am not sure though if adjustments to the machine could be made to make this work. Wearing the headgear is very comfortable. I was really expecting this to be great. But I would wake in the night with too much air whistling through the headgear, and often my nose felt irritated and uncomfortable. I would pull the mask off and turn off the machine in order to go back to sleep. 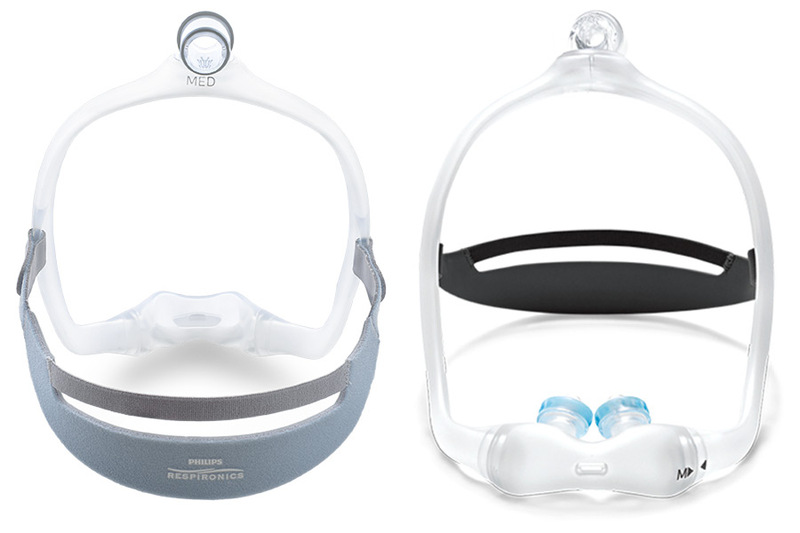 For 25 years I have used the Breeze SleepGear Nasal Pillows CPAP/BiPAP Mask with Headgear but unfortunately it is no longer available. Why such a great headset was discontinued is a mystery. 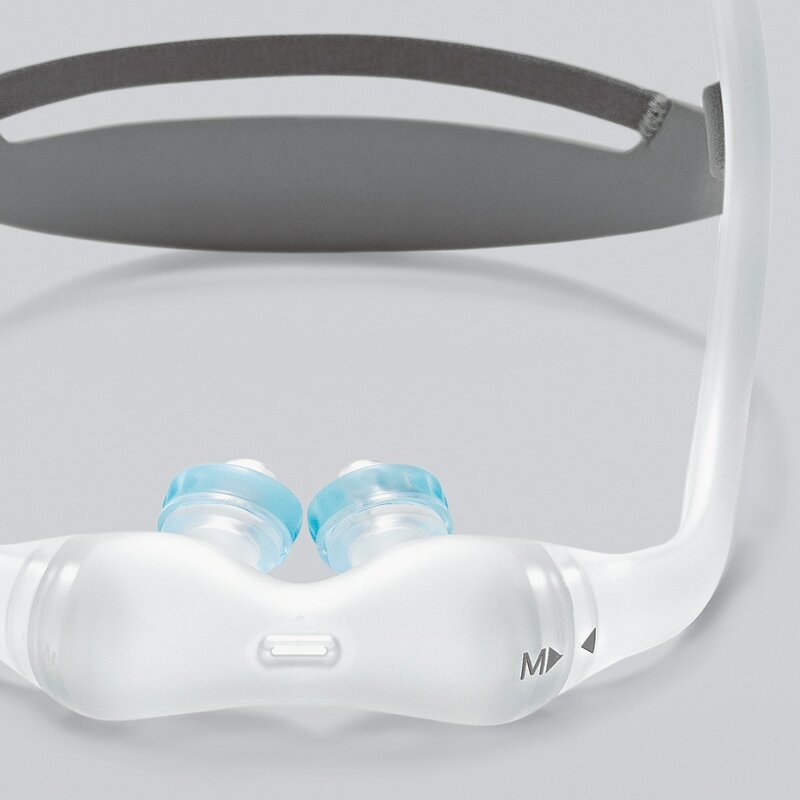 Using the DreamWear headset, no matter the size of the nasal pillow used or how I adjusted the pillows and headgear, I could never get a comfortable fit and always leaked air around the nasal area. Also, because of its design with air channeling through the side tubes going past your ears, the rushing air sound was significantly louder than my Breeze SleepGear headset. I like the way the head gear is supposed to work ...the air tube coming out the top. However I can’t seem to get the head gear to stay in properly/ secure enough. I also don’t feel the nasal pillows “seal” like they do on other head gear I’ve had. OMG I love it... Better than my discontinued Breeze!!!! I had the original Dreamwear under the nose Pillow with my Dreamstation. 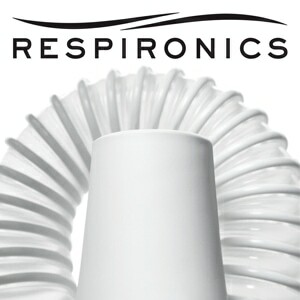 I have been using the Breeze with Nasal Pillows for years that is now discontinued! I did not like the Dreamwear under the nose cushion and used it once. I was desperate as my Breeze broke. 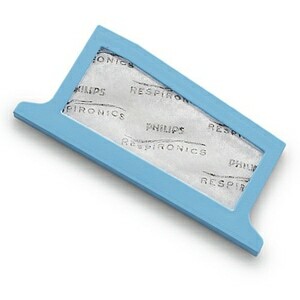 Then I saw Philips came out with the Dreamwear Gel Nasal Pillows and decided to purchase them!!! I love them so much!!!! So much more comfortable and so much better than my Breeze! I have tried a couple of different masks/headgear, but the DreamWear is the best. I can barely feel it there, it is so un-intrusive and I love not having the tubing crawling all over my face during the night. It is very quiet and it leaks very little (masks that don't leak are sort of like Big Foot -- you are eager to believe in them but so far, nobody has actually found one). And when it does leak, it leaks quietly. 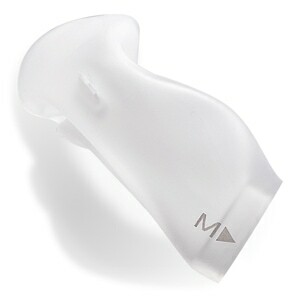 My previous nose pillows would hiss like crazy when they leaked and left sore red marks on my nose in the morning. This one doesn't bother my sensitive skin. I'm sticking with this one! The dream wear is my very first cpap so I don't have anything to compare it to. I am extremely claustrophobic so refused to wear a full face mask. I can stand this one. It is not too hard to get used to, but the head gear design is horrible. I took the strap off and turned it upside down where the small strap is on bottom and that helps a little but it still slides up off my head and has to be readjusted frequently during the night. So much for getting a good night's rest. Isn't that the point of a cpap? Please please please redesign the head gear.